Gardeners browsing a garden catalog and reading about the toad lily for the first time may understandably think this plant is a hoax; one of those “too-good-to-be-true” plants with a Photoshop-doctored picture and embellished description. How could something with such exquisite orchid-like flowers bloom in the most unforgiving heat of late summer and early fall? And it’s a hardy perennial, too? Fortunately for shade flower gardeners, this Asian native lives up to its hype. Toad lilies belong to the genus Tricyrtus, and are members of the Liliaceae family. 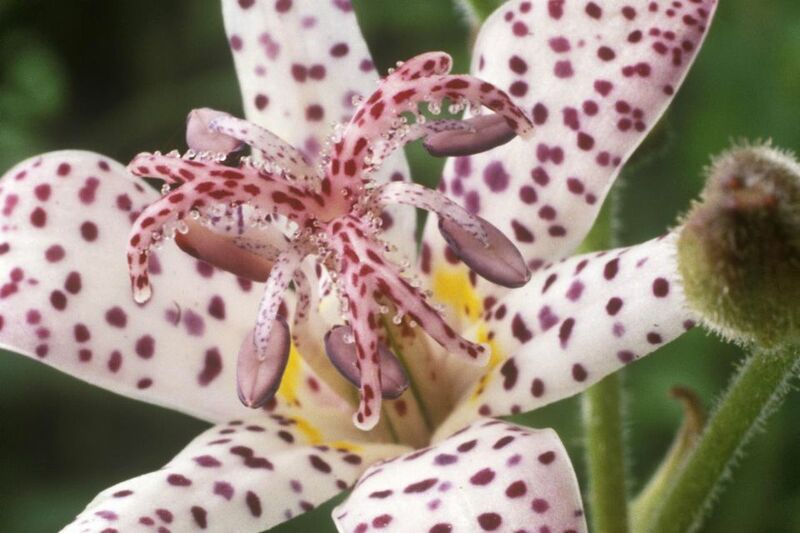 In spite of their tropical appearance, the toad lily is a fully hardy plant, and thrives in USDA growing zones 4 to 8. The flowers of toad lilies have six petals, typically held in an upright position. However, there are some unusual species with pendulous flowers that resemble campanulas in form. The petals and stigmas of toad lilies usually have showy speckles, ranging from red to purple. The flowers are only about the size of a quarter, but are numerous. Some say the blooms resemble orchids. In spite of their petite size, toad lily blossoms are an important source of nectar for wildlife. They attract butterflies, and hummingbirds appreciate this late summer source of energy as they prepare to migrate south. The moderately fuzzy leaves of toad lilies are lance-shaped, and some varieties have attractive brown mottling on the foliage. The foliage is late to emerge in the spring, so avoid treading on the landscape where you’ve planted toad lilies..
Toad lilies fill in an important gap in the shade garden, blooming when most other flowering plants are finished flowering. You can pair these plants with moisture and shade-loving foliage plants, like hostas and ferns; with annuals, like impatiens and coleus; or with flowering perennials for shade, like Indian Pink or columbine. Toad lilies fill a blooming gap in the shade garden when many ephemerals like bleeding heart have faded for the season. Be sure to plant toad lilies at the edge of the border, where you can admire the profuse but tiny flowers on one to three foot plants. Toad lilies also make attractive container specimens, although in colder regions they should over winter in the ground to for added protection to the roots and crowns. Toad lilies like part sun to full shade. The further south they grow, the more shade they require. The plants like consistent moisture, but well-drained soil. They don’t like wet feet and will experience rot in standing water. Toad lilies don’t recover well from transplant shock, so plant them immediately if you’ve obtained them through mail order, and give them a permanent home in the shade garden. You can propagate your toad lilies via seed or division. The seed requires stratification, which you can accomplish by sowing them in pots outdoors in the fall. The freezing temperatures followed by a thaw send a signal to seeds that it's time to get growing. Germination, and usually flowering, occur the following season. Toad lilies don’t compete well with other plants, so keep their space weed free. They don’t need fertilization, but a three inch layer of organic mulch will provide them a cool root run. Although toad lilies are relatively pest-free, slugs and snails do snack on the foliage. You can set out a piece of damp cardboard beside the toad lilies, where the pests will seek refuge during the day. Simply discard the cardboard with the unwelcome passengers attached. New hybrids from innovators like Terra Nova Nurseries as well as previously undiscovered species are hitting the market every year as toad lilies grow in popularity. ‘Amethystina’ bears tiny white blooms smothered with reddish brown spots. 'Lightening Strike' pleases all summer long with a display of gold streaked foliage. ‘Angel’s Halo’ produces white flowers with a yellow throat over several weeks, a lovely addition to the moon garden. ‘Eco Yellow Spangles’ is a late fall bloomer featuring red spotted yellow blooms. ‘Miyazaki’ has an arching habit with white flowers covered with purple speckles that run together. ‘Snow Fountain’ is a prolific bloomer with pure white flowers. The weeping toad lily, Tricyrtis ishiiana, bears gold bell-shaped flowers that dangle rather than grow upright, in contrast to other toad lilies. For gardeners who love variegated foliage, the bold striping of 'Imperial Banner' will be a welcome shade garden addition. What Are Flowers Allergy Sufferers Can Enjoy?